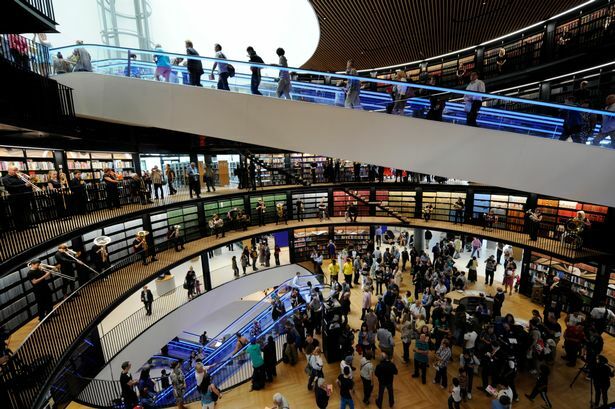 Authors and poets are among those joining a major rally to call for the Library of Birmingham&apos;s opening hours to be extended. The Friends of the Library of Birmingham will march from outside Waterstones in New Street from noon on Saturday to Victoria Square where there will be a rally. The group says it wants to show the city council there is widespread support for the library budget cuts implemented in April to be reversed. Among those due to speak are children&apos;s author Alan Gibbons and Tim Stibbons, the deputy chairman of the Writers&apos; Guild of Great Britain. Bob Whitehead, of the Friends of the Library, said the cuts, which have resulted in it closing earlier and entirely on Sundays, have made Birmingham a laughing stock - especially as it was so soon after the landmark building was opened with great fanfare. "People are travelling from all over Europe to see this wonderful building and when they get here it is closed," he said. "It has made us a laughing stock. We also have our aspiring students being locked out at times they want to study." The Labour-run city council has cut £1.3 million from the library&apos;s budget which has led to opening times being reduced from 73 hours a week to 40 and the staff cut by about half - approximately 100 posts. It has blamed government funding cuts and says the building is too costly to run while the Government has said the council should have placed it in trust to cut its costs. Mr Whitehead said: "We have the city council and the Government blaming each other but it is the city which is losing out. They have both played their part." He added that, when the city council consulted over its budget, "by far and away the largest response was saying &apos;don&apos;t touch the library&apos; but the council went ahead anyway".